I got a lot of good feedback on the game at the Indy Open. My wife's first trip to the hospital kept me away from the tourney Saturday night. Which, unfortunately, would have been the best time to run demos. Since everyone was too exhausted on Sunday to do more than ask a couple of questions before they took off. Not many stayed for the awards. 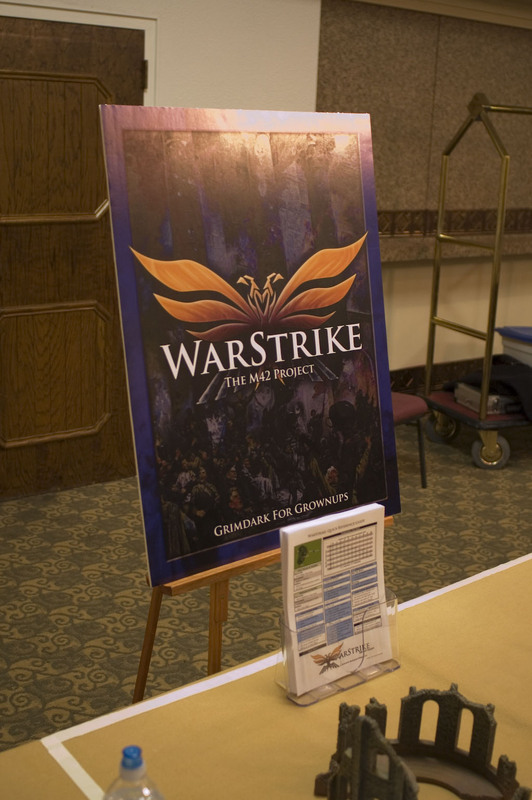 There was some real interest in WarStrike though, and I got invited to demo the game at a couple of stores and a club in the near future. The club, in particular, might end up being a valuable testing resource. I did get 5 test games in on Saturday with Jason, who was running the Dust tournament on Sunday, but had nothing to do until then. He had a lot of useful suggestions, and was willing to keeping playing new games in order to try them out. Which is the sort of extended test session that we've been needing. Being next to the Dust guys on Sunday was also pretty useful. As I got to find out what they liked and didn't like about that game. I've always considered Dust/FFG to be our real competition, and I've doubled down on that opinion after watching a Dust tournament. FFG is a smart company. I also had a chance to finally study the Dust:Warfare rulebook ($20 PDF download from FFG). While I'm still not fond of their dice mechanics, I do like how their rules are constructed from simple, well-defined pieces. The 6th Edition 40K rulebook was obviously trying to ape this with their huge special rules section. But Dust does it much better, of course. It's what we've been going for in terms of structure from the beginning. But it's nice to have an example to look at other than MTG. It also calibrates nicely for me the general level of complexity that we should go for, and how to progress from the simple rules to the complex ones. Flames is clearly written, but overly-complex and time-consuming. While Dust is just a bit too simple and flavor-light. The complexity balance for WarStrike is going to be about 2 parts Dust and one part Flames/40K. I do like their Axis and Russian vehicles quite a bit. So we'll be writing rules for them. I bought one walker at the tourney, and have just ordered a tank, a heavy walker, and an aircraft for vehicle testing purposes. Add in some third-party guard models, and we'll have the basis of an army example using minis from at least 4 manufacturers. As far as ideas that we might glean from Dust, we already have a unique take on suppression. Which Jason was pretty fond of. The only other Dust feature that really jumps out at me is the mission builder. 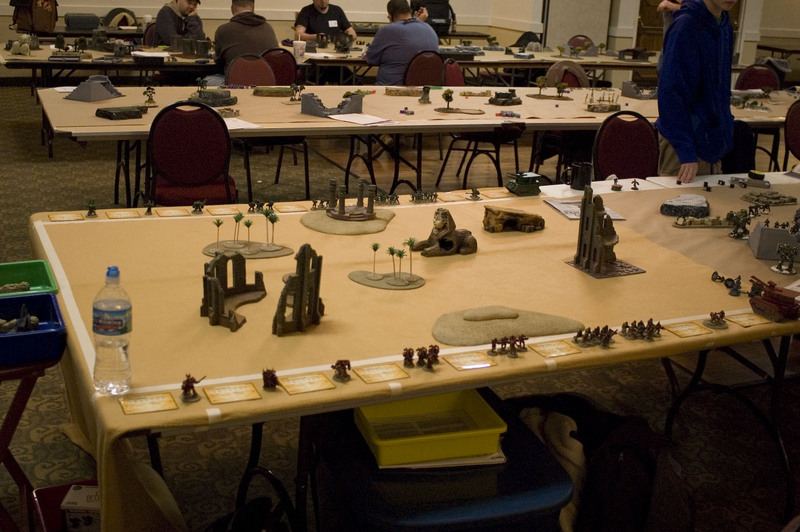 Which is sort of like 5th Edition 40K's mission matrix (roll mission, roll deployment), but with 'bidding' by the players that could affect those rolls. I don't see us copying that, for the same reasons that I've avoided a randomized mission/deployment system on the model of 40K's. Because I think that the way in which Flames structures its missions is superior, and allows for much more interesting & flavorful scenarios. So long as you don't make the same mistakes that Battlefront did. In randomizing reserve arrival locations, or screwing over certain list types by not letting them fully deploy in some missions. So rather than do what Dust does, I'm thinking that we could have 'strategy points' that would allow the players to affect certain mission variables in their favor. So each player would have, or would roll for, or buy, a number of 'strategy points'. Those points could then be used to tweak a mission's variables, or lock-in the 'normal' variable. At this point it's just a concept, and we're a long way from being able to implement this. But it's something to think about.